UPDATE 1 July 2018: The dedicated FileBot Subtitles PKG has been discontinued. FileBot 4.8.2 supports cross-platform licensing including full-featured APP and PKG packages for macOS without Mac App Store Limitations. A certain fruits company has recently changed its policy towards the download of movie subtitles. In order to comply with the review guidelines of said fruits company, future versions of the FileBot app may not contain the Subtitles feature. 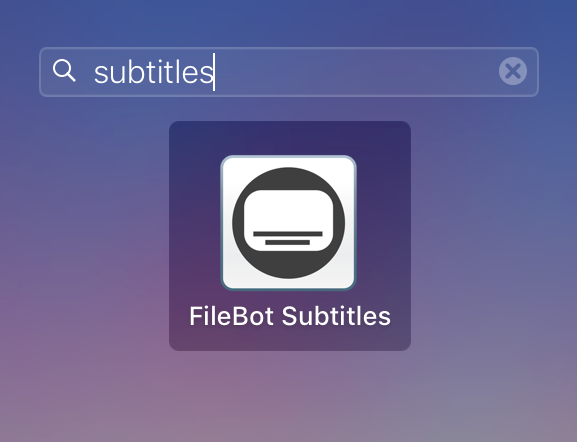 Hence, FileBot Subtitles is now a separate application on Mac OS X that you can download for free. If you're using FileBot Subtitles for the first time, please have a look at the Getting Started and the Video Tutorials first. I can only get this to work for one movie at a time. If I try to load a folder of 50 movies, it won't present any subtitle options. Are there any warnings? Logs? Did it complete the search? Have you tried waiting? I am getting a 404 not found trying to download this. Please try again. Should be fixed now. The requested URL /filebot/latest/FileBot_Subtitles.pkg was not found on this server. Just wanted to say: THANK YOU for this wonderful software. I own the App Store version, and the fact that you're still supporting subs is AWESOME. Really, really appreciate all you do. Also thanks for the blazing fast response to this thread. Your browser has probably cached the error page. It'll work if you clear the browser cache. sorry, the link https://get.filebot.net/filebot/latest/ ... titles.pkg just gives me a "NOT FOUND". sh -xu <<< "$(curl -fsSL https://raw.githubusercontent.com/filebot/plugins/master/installer/subtitles.sh)"
Warning: Illegal date format for -z, --time-cond (and not a file name). *  subjectAltName: host "get.filebot.net" matched cert's "*.filebot.net"
Ok, installed 4.8.2 - but now, I have an "UNREGISTERED" version. That is a bit frustrating, as I have just bought it on the Apple App Store at full price today - and was sorely missing the Subtitle function . Sorry, can't be helped if Apple doesn't allow certain features in the Mac App Store. If you PM me your name & email then I can send you provide you with a free 1-year license for the non-App-Store version.